Are you looking for a delicious vegetables recipe with a difference? If you are, you’ve found it! Here’s my rolled aubergines with raisins, capers & walnuts for you to enjoy. Aubergines were introduced to the Mediterranean region by the Arabs in the Middle Ages and Sicilians use them a lot in their cooking. 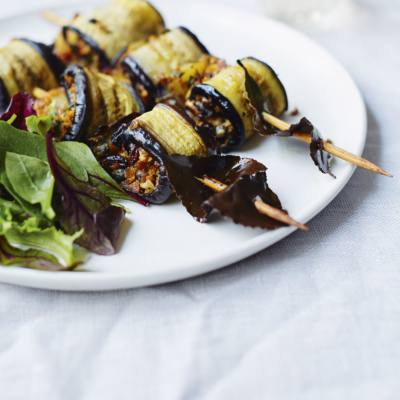 Stuffing sliced aubergines with cheese, breadcrumbs and other goodies is a particularly popular way of serving them. Feel free to be creative with your fillings – this recipe is not about precision. Choose the heaviest aubergines you can find and cut just before cooking to avoid discoloration. Serve with a green salad. Feast your eyes on the finest rolled aubergines with raisins, capers & walnuts! It’s straightforward and fun to make this great dish. Simply follow the instructions below and get the perfect result. Soak 4 wooden skewers, about 30cm long, in cold water for at least 30 minutes. To make the stuffing mixture, put the raisins in a small bowl or cup, pour over the Marsala and leave to soak for 20 minutes, then drain. Heat the olive oil in a medium saucepan over a medium heat. Add the shallots and fry for 5 minutes or until softened, stirring occasionally. Stir in the parsley, season with salt and pepper and remove from the heat. Add the walnuts, lemon zest, breadcrumbs, capers, Pecorino and drained raisins. Stir to combine and set aside. Preheat the oven to 180°C/gas mark 4. Bring a large saucepan of salted water to the boil. Using a long, sharp knife cut each aubergine lengthways into slices about 1cm thick. Discard the first and last slice. Use the 12 widest slices. Drop the aubergine slices into boiling water, bring back to the boil and simmer for 4 minutes or until softened. Drain thoroughly then spread out on kitchen paper to dry. 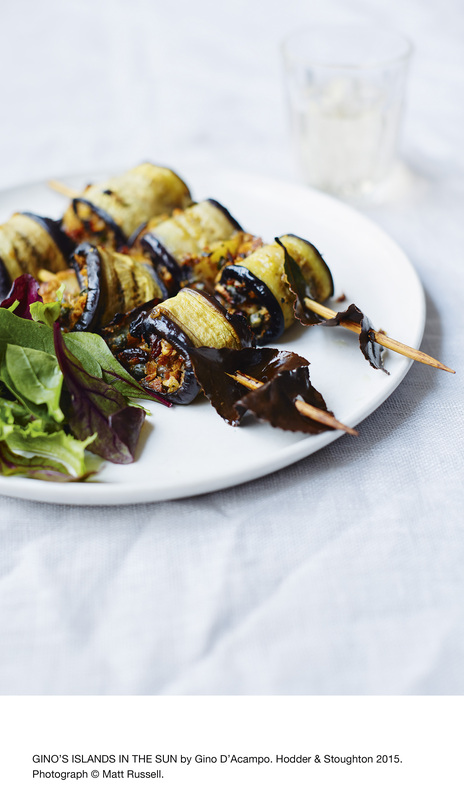 Place the aubergine slices on a board and spread the stuffing mixture equally on all the slices. Roll up each slice ad thread 3 aubergine rolls on each skewer. Thread a bay leaf on either end of the skewer. Arrange the skewers on a large oiled baking sheet. Season with salt and pepper and brush over the lemon juice and extra virgin olive oil. Bake for 40 minutes. Serve immediately. Once you’re done, simply sit back and enjoy your rolled aubergines with raisins, capers & walnuts and don’t forget to check out other great authentic Italian recipes including great antipasti recipes, Italian pasta recipes, Italian soup recipes, Italian beef dishes and authentic pizza recipes.